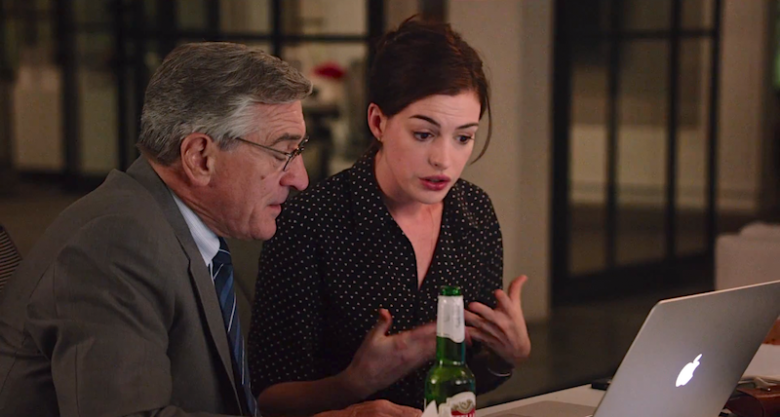 In The Intern, Ben Whittaker (Robert DeNiro) is a 70-year-old widower who answers a help-wanted ad to be a senior-aged intern in a start-up eCommerce company. The story is the classic ‘put the main character in unfamiliar surroundings’ tale as Whittaker is assigned to the company founder, Jules Ostin (Anne Hathaway). When Whittaker arrives, the company, started less than two years ago in Ostin’s kitchen, is experiencing growing pains and Ostin is overwhelmed. She is also being pressured to bring in a CEO so Ostin can “focus on the creative side” of the business. Ostin, of course, bristles at this suggestion and struggles to find a way to do it all — like find time for her husband and young daughter — while growing the company. As the story progresses, Ostin is dealt a devastating blow when she learns her husband — who gave up his career to raise their daughter when her company took off — is cheating on her. The movie’s comedy is driven forward by Whittaker’s presence. There is the expected resistance from Ostin when she learns Whittaker is her intern. At first she tries to get Whittaker reassigned then Ostin fires him (and then hires him back). Whittaker hangs on through the ups and downs and eventually becomes a mentor to Ostin and several of his co-workers. One of the funnier scenes in the movie involves Ostin erroneously sending an email to her mother — an email that criticizing her mom. When the IT team can’t retrieve the email — it is Whittaker who comes up with a solution: break into the mother’s house and delete the email. Whittaker, with his three 20-something bumbling sidekicks manages to pull it off, but their plan nearly unravels when the getaway driver (played by Adam DeVine — Pitch Perfect) is dancing to the music on the car’s radio instead of watching for his co-conspirators. Although the performances by all the key players are above par, the comedy is just too sparse for a 90-minute movie. Rating: 3.5 out of 5 stars. It is what my family calls a ‘video movie’ which means it’s worth watching, just not at theater prices. (We should update our phrase to ‘DVD movie’).